Molecular Dynamics in Restricted Geometries Edited by Joseph Klafter and J. M. Drake This investigation of the chemistry and physics of complex systems focuses on the role of spatial restrictions on molecular movement. A practical source-book for researchers in chemical physics, chemical engineering, and condensed matter physics, and for graduate students in these fields, it covers a broad range of topics and critically evaluates methods as they are employed. Among the many topics it covers are: relaxation and diffusion in restricted geometries, excitation energy transfer and photoinduced electron transfer phenomena in some confined systems, electron excitation transport in micelles, polymers and multilayers, and electron excitation transport on polymer chains. 1989 (0 471-60176-4) 437 pp. About the authors PARAS N. PRASAD is Professor of Chemistry and Director of Photonics Research Laboratory at the State University of New York at Buffalo, where he has been since 1974. He is the coeditor of the books Nonlinear Optical and Electroactive Polymers and Nonlinear Optical Effects in Organic Polymers. Dr. Prasad was an Alfred P. Sloan Fellow and received two gold medals from Bihar University for standing first in his MSc and BSc exams. He received a PhD in chemistry from the University of Pennsylvania in 1971. DAVID J. WILLIAMS has been Head of Molecular and Optical Electronics Laboratory at Eastman Kodak Company since 1985. Previously, he was manager of the Chemical Research Area at Xerox Corporation. 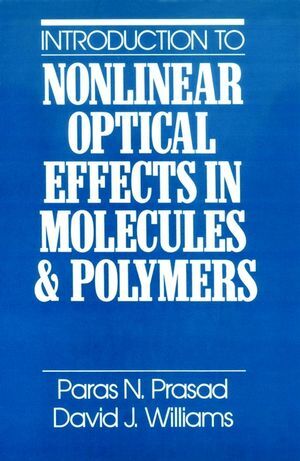 He is the editor of the book Nonlinear Optical Properties of Organic and Polymeric Materials and a member of the American Chemical Society and Optical Society of America. Dr. Williams received his PhD in chemical physics from the University of Rochester in 1968. Basis and Formulation of Nonlinear Optics. Origin of Microscopic Nonlinearity in Organic Systems. Measurement Techniques for Second-Order Nonlinear OpticalEffects. A Survey of Second-Order Nonlinear Optical Materials. Measurement Techniques for Third-Order Nonlinear OpticalEffects. A Survey of Third-Order Nonlinear Optical Materials. Nonlinear Optics in Optical Waveguides and Fibers.